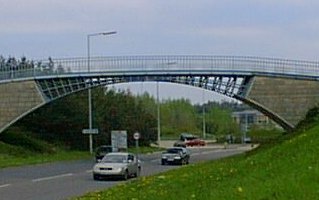 The world's first, internationally most famous, and locally largest iron bridge, pictured above, is that which gives its name to the town of Iron Bridge in the south of Telford and is the town's most famous feature. It was built across the River Severn in 1779 by local ironmaster Abraham Darby III to demonstrate the quality of the iron now produced by the process his grandfather invented to smelt iron using coal rather than coke. Immediately, it was world-famous, President Thomas Jefferson of the USA being one of the first to buy an engraving of it. Living close by, I became interested first in that bridge, then in others nearby, then in yet others further afield. 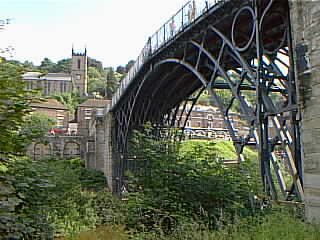 Upstream of Ironbridge is the confluence of the Severn and the Cound Brook, and it is not surprising that when Thomas Telford, then Road Engineer to Shropshire County, designed two bridges to cross the brook, he should use the local industry to build them. 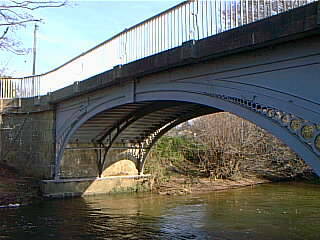 This iron bridge with stone buttresses is found by approaching Cound from the A458 to the north. Photo 1 is some years old - the tree has grown considerably - and was sent me by Ellen Francis Macinterney of the University of Adalaide, with the question which started me on this most interesting investigation. Here is her Finite Element Analysis (large). 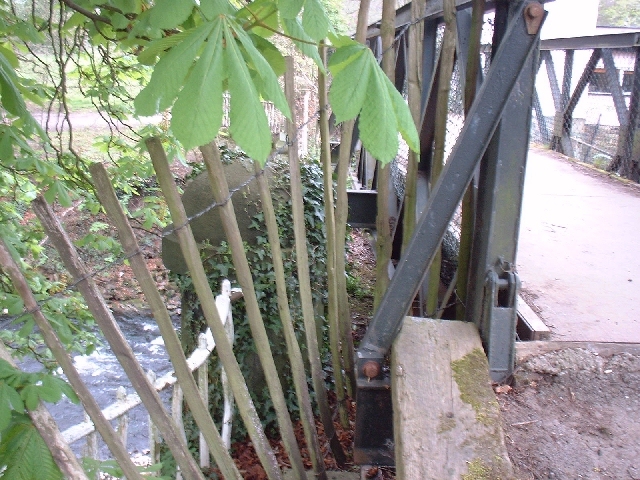 Photo 2 is taken from almost the same angle - the tree is to the right of the camera - and shows the bridge today. The legend "Cast at Coalbrookdale 1797" at the apex of the arch dates it less than twenty years after the Darby iron bridge. 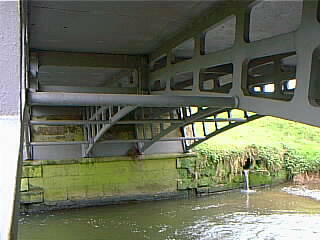 Photo 3 shows the construction of the cast ribs under the bridge. 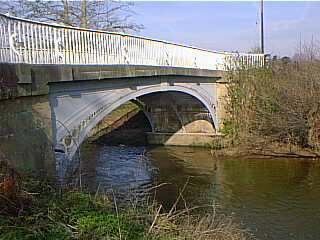 Brabyns Bridge is a lighter affair with a single arch, carrying a narrower road than Cantlop Bridge. 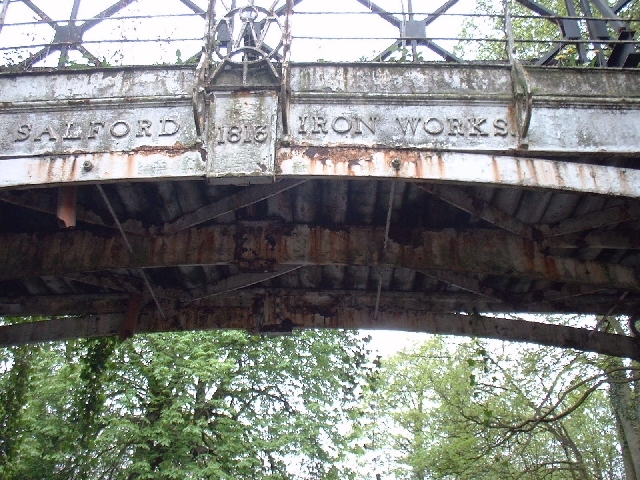 The plate at the apex gives the date and Salford Iron Works, as the maker, placing it chronologically between those two. 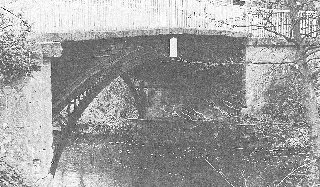 Although auperficially similar, by looking underneath, one can see that the bridge deck was of wood (like the Woodbridge of 1780 downstrean of the Ironbridge, long gone). Also, the ironwork is bedded into an angle in the masonry of the buttresses, instead of sitting on an angled face. The orginal parapet rails are still there. It stood on the approach to Brabyns Hall, and the ends of the parapets have ornamental posts. 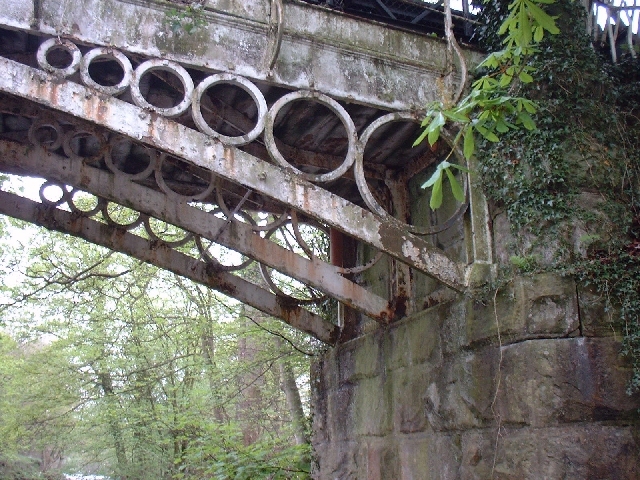 An account of its history, the reason it is disfigured by a bailey bridge and for its poor condition can be found on Mark Whittaker's The Marple Website here. 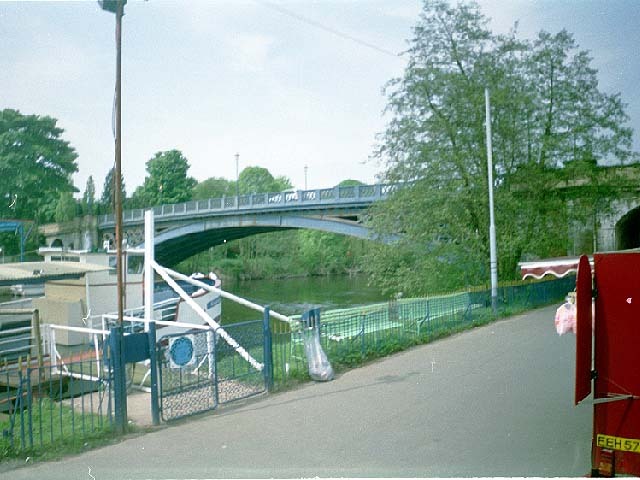 Update 13/06/2009: The restored Brabyns Bridge was opened today! See here, and my photos of the restored bridge here. 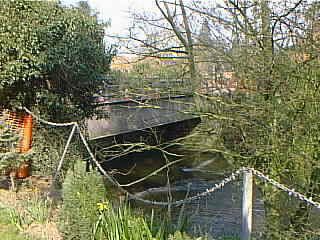 Photo 1This is the second of Telford's bridges across the Cound Brook. 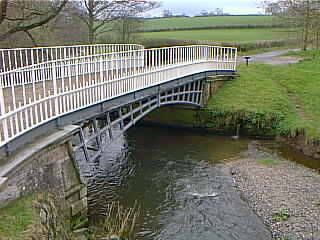 The photo shows a rather similar bridge to Cound Arbour, which lies on the back road north from the tiny village of Cantlop. It is in the care of English Heritage. Photo 2 shows the construction once again. Photo 2 doesn't show the construction too well - sky was too bright. I spotted this one when passing by, and unfortunately didn't have a camera handy. 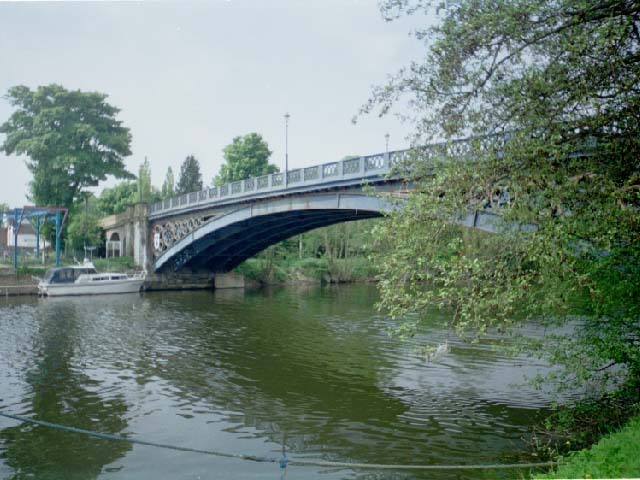 It is a small, low bridge with three ribs supported on an angled face on the stone of the buttress, and the original (wooden?) deck is gone, replaced by a concrete one. 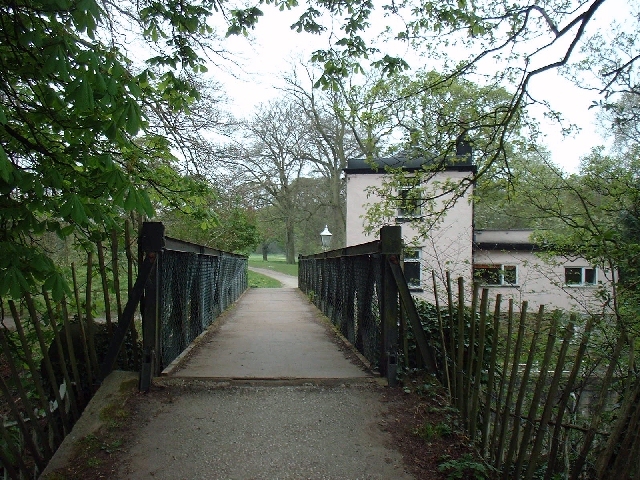 The carriageway to Gadebridge House originally passed through a ford until, around 1840, Sir Astley Paston Cooper arranged for a local iron founder, Joseph Cranstone, to erect a bridge. With its attractive design resembling bamboo, it echoes the Chinese style popular at that time (Quote from a now-defunct Hemel Hepstead history site). 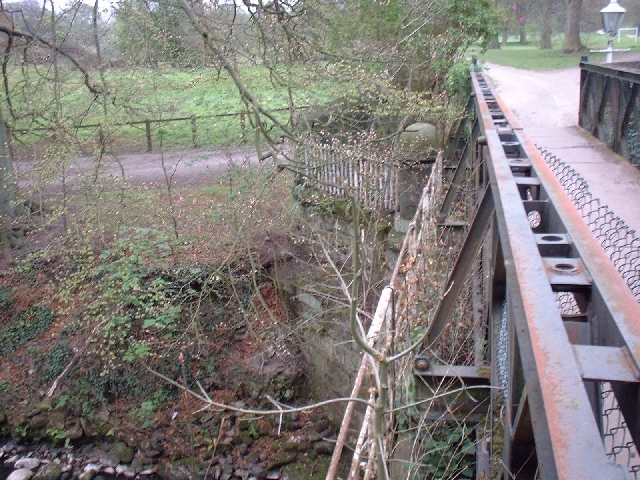 Photo 1 shows the downstream side of the bridge: note the similarities with the smaller, earlier bridges above. 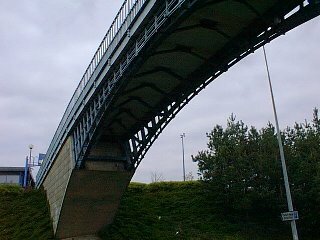 Photo 2 taken from further away, shows the flatter arch and longer span of this bridge. 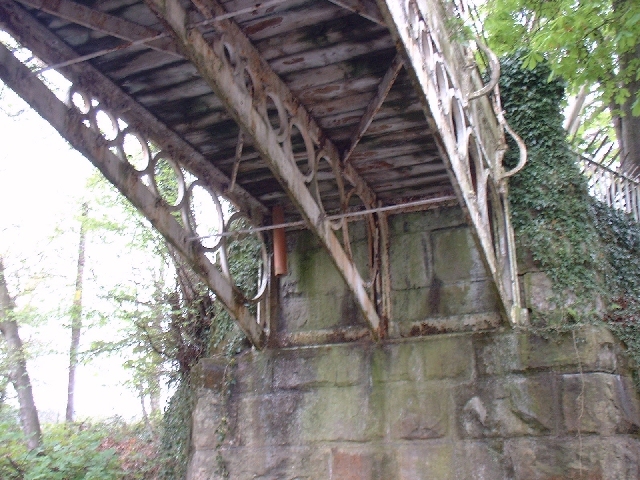 Photo 1 shows a steel girder railway bridge of much later design and an extremely common type. I include it because I was lucky enough to get information about it from the landowner who allowed me to walk on his lawn to photograph it. 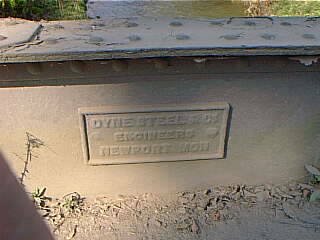 Photo 2 shows the plate on the bridge, which reads Dyne Steel Co Engineers Newport Mon: not, then, of local workmanship. 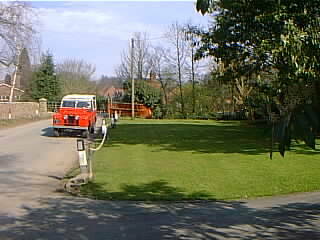 Photo 3 shows the lawn, filled in over the lane that led down to the former ford. In 1941, when the present landowner came from North Wales, the line of the road was still apparent, with an iron railing in place on the left. 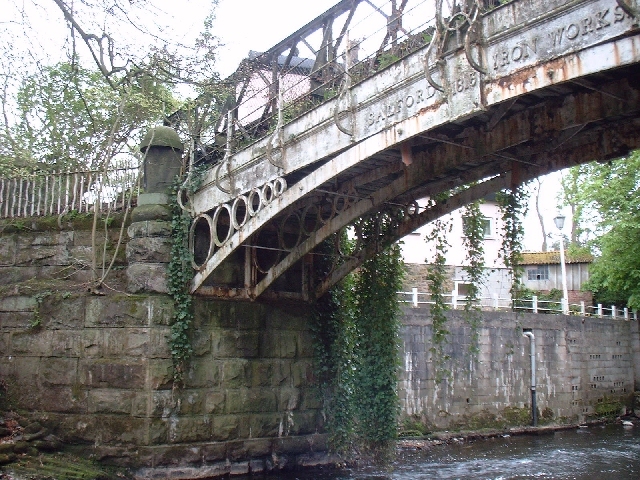 It was overgrown with large trees, which dates the "new" bridge back into the nineteenth century.